The cover photo on this issue is actually from 2010 when Bert Colbert obtained his Hydra Sports, later to be named Bankers Hours. The eucalyptus trees north of the Coast Guard station are always a great backdrop for photographs. 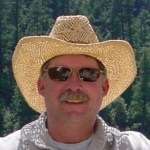 Congratulations to Jimmy Yarnall who was appointed to the PFMC Salmon Advisory Subpanel. That leaves Bob Smith as HASA’s lead salmon representative and an opening for another rep. It is good to know we have great people working to maintain a sustainable recreational salmon fishery. Unfortunately we have to announce the resignation of HASA Director Jed Douglas. Jed has accepted a position in Marin County and will be living in the San Francisco Bay Area. He plans to return to Humboldt County in about 10 years and wants to return to service with HASA. We thank Jed for his valuable contribution and will welcome him back in 10 years. The Trinidad Pier Youth Fishing Tournament was a huge success with 96 kids participating. Here is the news release provided by Ken Jones. It was windy the night before but Sunday, September 25, 2016 turned out to be a beautiful day at Trinidad, the small town located on California’s scenic redwood-forested, northwest coast just 24 miles north of Eureka. It was a perfect day to go fishing! Luckily, a kids fishing derby just happened to be scheduled at the Trinidad Pier. The event was the 3nd Annual Trinidad Pier Youth Fishing Derby sponsored by United Pier and Shore Anglers of California (UPSAC), the Cher-Ae Heights Indian Community of the Trinidad Rancheria, the International Game Fish Association (IGFA), Humboldt Area Saltwater Anglers, Pacific Outfitters, and the California Department of Fish and Wildlife. 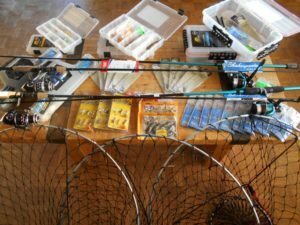 Free loaner rods and reels, free terminal tackle, free bait, free hot dog lunches, raffle prizes, and a winner in each age group helped generate excitement. 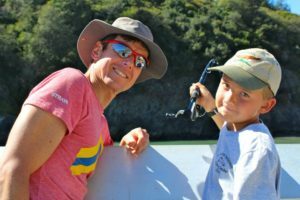 In response, 96 youngsters turned out to enjoy the short-sleeve weather and fishing which, although a little slow, did produce a variety of fish—cabezon, buffalo sculpin, kelp greenling, and shiner perch. As at the previous tournaments, a large group of parents and friends, estimated at 200+ people (not counting dogs) also attended making this a true family event, one full of smiles and good-will. Age group winners: 3-5-year-old winner—Malaki Costa (Trinidad); 6-year-old winner—Sonny Hopper (McKinleyville); 7-year-old winner—Dylan Collart (McKinleyville); 8-year-old winner—Jasiah Wheeler (Trinidad): 9-year-old winner—Jocelyn Sundberg (McKinleyville); 10-year-old winner— Emma Sobehrad (McKinleyville); 11-year-old winner—Gabriella Davidson (Trinidad): 12-year-old winner—Andrew Leverett (Eureka); 13-year-old winner—Devon Rodriguez (Trinidad); 14-year-old winner—Alaura Romo (Eureka); 15-year-old winner—Cameron Romo (Eureka). Four of the winners were repeat winners—Malachi Costa who won in 2014, Sonny Hopper, Jocelyn Sundberg and Alaura Romo who won or tied their age group divisions in 2015. Donating money, food and gifts for the meals, insurance and prizes was a variety of different groups and businesses—Cher-Ae Heights Indian Community of the Trinidad Rancheria, Humboldt Area Saltwater Anglers (HASA), Pacific Outfitters, United Pier and Shore Anglers of California (UPSAC), Ken Jones—Pier Fishing in California (pierfishing.com), and Ed Roberts. A custom built rod made by Dan Troxel of BassMan Dan’s Custom Fishing Rods was raffled off with proceeds going to help pay next year’s costs. Organizers were Ed Roberts of the California Fish and Wildlife Department, Ken Jones of United Pier and Shore Anglers of California (UPSAC) and pierfishing.com, and Grant Roden of the Cher-Ae Heights Indian Community of the Trinidad Rancheria. Helping out at the event were a number of different people, especially a group from the California Department of Fish and Wildlife—Mary Patyten, Carrie Wilson, Dan Troxel, Dustin Hixon, Matt Wells, Dave Walker, Rob Mengel and Ed Roberts. 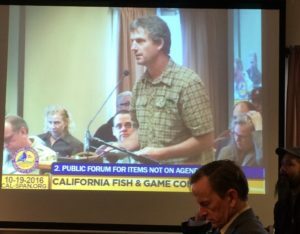 HASA President Scott McBain gave a presentation on the Pacific halibut allocation to the Fish and Game Commission at a public meeting in Eureka on October 19th. He did a great job explaining the history and how California got shorted when the total available biomass was raised by 170,000 pounds based on IPHC surveys conducted off the California coast. The California catch share was only raised 3,000 pounds with the rest of area 2A getting their percentage totaling 167,000 pounds. 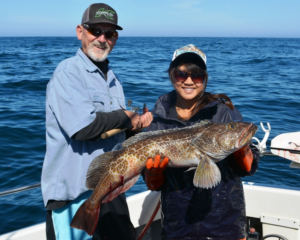 The sleight was lost on the Commissioners because CDFW Director Chuck Bonham pointed out what he thought was a huge success when we went from 1% to 4% before the IPHC surveys. He credited the work of CDFW personnel and the work of HASA to get that original increase but did not think there was a chance of getting more. He indicated that CDFW would not even try without more science and economic studies. Tom Marking spoke on the subject last and explained further the lost opportunity, where we could have received the increase we want and all of 2A would still have received increases. That is water under the bridge. Now any increase we receive will have to come from some other group’s allotment. Future decisions will likely be purely political. HASA and other NGO’s have joined the Golden Gate Salmon Association (GGSA) in opposing Senate Bill 2533 introduced by Senator Feinstein and HR 2898 (Valadao). The drought bill is designed to maximize water usage and deliveries during drought conditions but at a huge cost to Central Valley salmon. You can read the GGSA’s opposition letter here. HASA is continuing to follow many marine management programs. The Marine Protection Area baseline studies have been released for the North Central Coast and the North Coast will be released next summer. The reports can be seen at http://oceanspaces.org/. 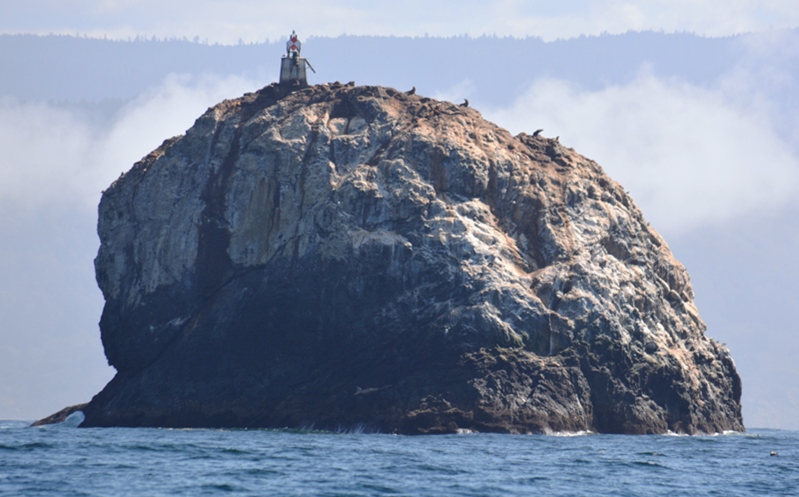 Another project is the “Harmful Algal Blooms and California Fisheries” which will study the effects of algal blooms (HABs) like the one that produced domoic acid in Dungeness crab. The project is managed by the California Ocean Science Trust and the Ocean Protection Council, with the goal of understanding the effects of HABs, their predictability, and develops measures to minimize the impacts. With ocean conditions changing with the climate we could see an increase in these events. Check out their blog here. HASA will continue to keep you informed through this newsletter, our website, Facebook, and the Humboldt Tuna Club discussion board. effort to determine the health of the species. I fished the first day with four other anglers and was excited to learn we would be fishing Reading Rock, a place I’ve never been. 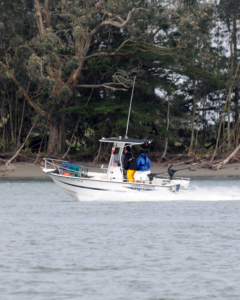 It was a two and a half hour run from Humboldt Bay on a fairly good ocean. We arrived around 10am and the fishing started slow. But Captain Klassen moved us around and soon honed in on the fish. 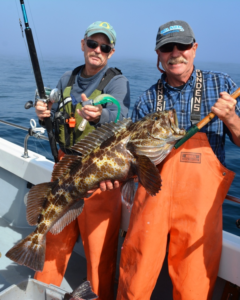 By 2pm we had 65 lingcod on the boat that ranged in size from 16 inches to close to 20 pounds. We did not catch any really big fish. There were a fair number of rockfish caught but the lings dominated by far. The best lure was a swimbait, with flutter jigs doing well. The scampi tails did not work very well at all. The next day Klassen took his group to the Cape where the bite was slower. They caught the 35 lings to reach the goal of 100 but had to work to get it done. We will share Laurel Lam’s findings when they become available.